This wonderful species is the national flower of Brazil (Good choice) . It is found as an epiphyte in open forest up to around 1000m where it experiences a warm wet summer and a cool dryer winter. With us it reliably flowers in June and the greenhouse where we keep the large plants hanging high in Warm America with a minimum temperature of 15C and good light in baskets of large bark which allows lots of air spaces for the thick and abundant roots. The variety shown above is ‘venosa’ referring to the dark pink veins and is a very striking plant. We have several clones of this species and a check on the internet shows that there is a fantastic diversity of coloured varieties available. We have also found this a great species to raise from seed as the seedlings are really vigorous and plants usually reach flowering size four years from de-flasking. Beautiful. I love the colour. 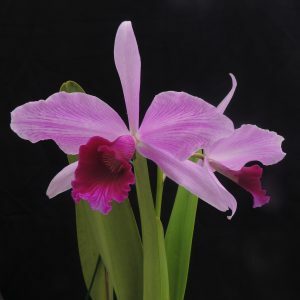 My Cattleya Purpurata is infected by Scale Insects, sort of white clumps found along on new growth leaves and at the bottom of the young pseudobulbs. I have tried to remove them by washing the leaves by hand and also sprayed by the pesticide “Provado The Ultimate Bug Killer” but neither seems to work as these insects keep re-developing after a couple of weeks. Unfortunately I am unable to include a picture of it here. 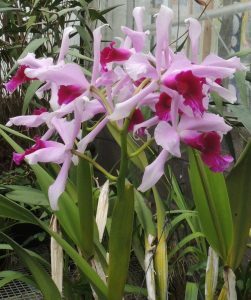 I would be very grateful for your advice me on how to control these insects for good and for my Cattleya to grow healthily. Scale insects are a real pain and difficult to get rid of quickly. Meths on a cotton bud or cotton wool is great for removing the ones you can see (especially clumps of young stages on the underside of leaves or tucked into crevices. But be aware that one treatment will never get all of them. We currently spray with Decis but change insecticide regularly to avoid resistance problems.